Just recently, an image of the upcoming Zotac GeForce GTX 970 was revealed by PCHub, a Philippine-based retailer, on their Facebook page. It seems that the image was taken down immediately since this was not supposed to be revealed at the first place. Intentional or not, it’s all over the net now. Well, it’s not surprising anyway since it was previously reported that Gigabyte and Asus’s GTX 980 and GTX 970 already got listed, and Galaxy’s GTX 970 including its benchmarks were also recently leaked, and finally MSI shows of their new Twin Frozr V custom cooler which the company intends to use on their upcoming MSI GeForce GTX 980 and GTX 970 Gaming graphics cards. 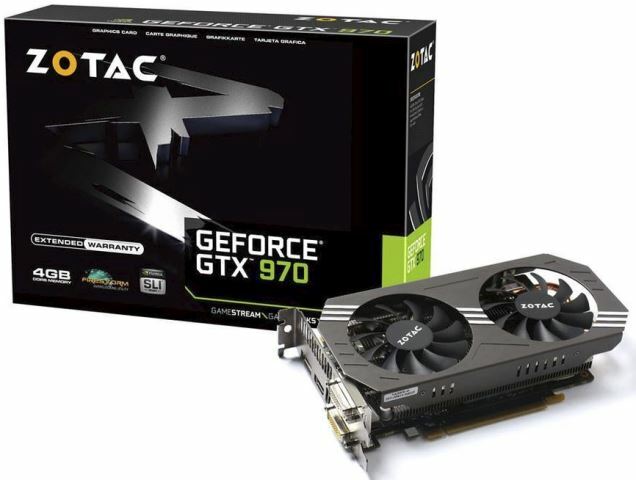 Aesthetically speaking, I’m quite disappointed with the design of the Zotac GeForce GTX 970. It looks plain and feels like a mid-range graphics card, similar to a GTX 760 or GTX 750 Ti. I just hope Zotac will be releasing a much better custom cooler design with their GTX 980. The Zotac GeForce GTX 970 specifications were not revealed, but based on the recently leaked Galaxy GTX 970, it may feature 1664 CUDA cores, 138 TMUs, 32 ROPs, 4GB GDDR5 memory running on a 256-bit memory interface. The base clock speed of the GTX 970 could be 1051MHz with a GPU boost speed of 1178MHz, and a memory clock speed of 1753MHz or 7012 MHz effective. You can also see some leaked 3DMark Fire Strike benchmark scores of the GTX 970 and GTX 980 here. The upcoming GeForce GTX 980 and GTX 970 are expected to be revealed during an upcoming NVIDIA Gaming event this September 19, 2014. But it is also reported that the actual availability of the GTX 980 and GTX 970 could be on October. However, another retailer from the Philippines said that they will have a GTX 970 on stock by 3rd or 4th week of September. This is still unconfirmed so take this information with a grain of salt.